M40 west. Join A40 at Oxford. Follow A40 into and through Charlton Kings. At traffic lights where Cirencester Road joins from left, go straight on. At next set of lights, turn right into Hales Rd, keep on this road for 1.5 miles. After 1.0 miles, road bears round to right, then left. Turn left into Whaddon Road. Go straight over small roundabout, continue for 0.5 miles. Ground and car park on the right. Train: Cheltenham Spa station is around 2 miles south west from Whaddon Road. Buses F and G go to the Town Centre and then the ground is an approx. ten minute walk. Connecting from High Wycombe is not that straight forward. Options are to go to London Marylebone, then via London Paddington and change at Swindon; or to go Birmingham Snow Hill and then Birmingham New Street to Cheltenham Spa. The latter is the faster option but allow at least three hours for travelling in this manner. Well liked central defender at Wycombe who made over 200 appearances for The Wanderers between 1981 and 1986. Decided to move to Cheltenham Town following Wycombe's relegation from the Gola League where he quickly became a favourite with Robins fans. Martin O'Neill brought him back to Wycombe towards the end of the 1992/93 promotion campaign where he did enough to join in the 'going up' celebrations. Martyn Lee - Former Wanderers Youth Teamer loaned to Town towards the end of the 2001/2 season and had a hand in their play-off success. 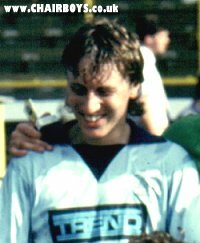 Steve Abbley - Right-back who joined Wycombe from Cheltenham in July 1988 and was ever present during the 1998/89 season. Joined Tonbridge in July 1990 following a fall-out with Martin O'Neill. Had a three year spell at Swindon Town prior to his time with Cheltenham. Now Chairman at Cirecenster Town. Paul Barron - Goalkeeper who made a couple of appearances for Wycombe in the 1973/74 season before moving into the pro game with Plymouth. Other clubs included Crystal Palace West Brom, QPR and a short loan spell at Reading before finishing his playing days with Welling United and Cheltenham. Mickey Bell Defender who controversially moved to Bristol City from Wycombe in the summer of 1997. Originally joined Wycombe from Northampton Town in 1994. Joined Cheltenham in January 2006 on a free following a short spell with Port Vale. Alan Bennett - Made 26 appearances for Wanderers during an 18 month spell that started when he joined on loan from Brentford in January 2010. A former trainee at Reading but made his pro debut while on loan at Southampton. Switched to Cheltenham in the summer of 2011, going on to make 73 appearances before joining Wimbledon in January 2013. Mark Boyland - Striker who moved to Wycombe from Cheltenham in 1987. Scored 10 goals in 23 apps for Wycombe before moving to Aylesbury United. Martin Blackler - Former Swindon Town and Cheltenham Town midfielder who spent three years with Wycombe after moving from Trowbridge in August 1988. Made 71 appearances for Wycombe before moving to Wealdstone. Kim Casey - Prolific scorer in the non-League game who joined Wycombe in Jan 1992 from Cheltenham Town. Scored 20 goals in 50 apps for Wycombe before moving to Solihull Borough. Best remembered for his time with Kidderminster Harriers. Sido Jomabti - Portugeese born defender who joined Wanderers on a free from Cheltenham in the summer of 2014 having made 134 appearances for The Robins in a three year spell. Spent time in non-League football with Weymouth, Basingstoke Town and Bath City before moving to Cheltenham in the summer of 2011 for a 'nominal fee'..
Julian Lailey - Defender who made just over 100 appearances for Wycombe between 1968 and 1971 before transfering to Cheltenham Town where he became a teacher. Graham MacKenzie - Played as a teenager for Wycombe in the 1970's before moving to Cheltenham in 1978. Later went on to become a regular in the successful Kidderminster Harriers team of the 1980's. Made 89 apps for Wycombe, scoring 15 goals. Mickey Nuttall - Joined Wycombe during the 1990/91 season from Cheltenham for �6,000. Scored 13 goals in 30 apps for Wycombe. Went on to play for his home town club, Boston United, after leaving Wycombe before spells with Kettering, a return to Boston. Played in the League for Crewe and Peterborough. Marlon Pack - Former Youth Team player at Portsmouth who made 9 loan appearances at Wycombe during the opening stages of the 2009/10 season, including his Football League debut, but was sent back to his home town club when Gary Waddock was appointed Manager. Went on to have loan spells with Dagenham & Redbridge and then Cheltenham in August 2010 before making his move permanent to The Robins in May 2011 having made just one League appearance while at Portsmouth. After more than 130 apps for Cheltenham joined Bristol City in August 2013 for a �100,000 fee. Paul Sanderson - Appeared five times for Wycombe at the start of 1989/90 season before joining Cheltenham Town. The former Cardiff City striker also played for Walsall in the 1987/88 season. Nathan Tyson - Former Reading trainee who spent a short spell on loan at Cheltenham Town towards the end of the 2001/2 season when The Robins gained promotion to Division Two via the play-offs.Originally joined Wycombe on loan from Reading in December 2003 before the deal was made permanent just prior to transfer deadline day in March 2004. Anton Vircavs - Popular centre-back with Wycombe in the first half of the 1980's. Moved to Cheltenham in the summer of 1986 following Wycombe's relegation from the Gola League. Returned to Wycombe towards the end of the 1992/93 season for a few cameo appearances during the promotion parties. Ian Westlake - Former trainee with Ipswich Town who joined Cheltenham from Leeds United on loan during the 2008/9 season before a permanent move in January 2009, amking 26 appearances before spending the last two months of that season on loan at Oldham Athletic. Signed for Wycombe by Peter Taylor from Cheltenham in the summer of 2009 but made just 10 appearances during a two year spell at Adams Park. Previously played at Brighton. Chris Westwood - Made close to 300 appearances for Hartlepool after moving their at the start of the 1999/2000 season following time with Wolves and Reading. Part of the Pools side that won promotion from the basement division at the end of the 2002/3 season. Went on to enjoy successful spells with Walsall and Peterborough United, where he made 9 appearances on loan at Cheltenham during the 2008/9 season before his move to Wycombe in the summer of 2009. Chris Zebroski - Nomadic striker who made a name as a prolific scorer for Torquay United in two spells. Originally made his Football League debut for Plymouth Argyle in 2005 before a move to Milwall where he was first loaned to Oxford United and then to Torquay for the whole of the 2007/8 season. Netted 18 Conference goals and prompted then Wycombe Manager Peter Taylor to sign him following his release from Millwall in the summer of 2008. Scored a relatively disappointing 9 goals in 55 apps for Wycombe before returning to The Gulls in November 2009 on loan and then permanently in the January 2010 transfer window. Went on to have a spell at Bristol Rovers before spending part of the 2012/13 season at Cheltenham where he scored 6 times in 24 appearances before time with Eastleigh and then signing for Newport County in the summer of 2013.